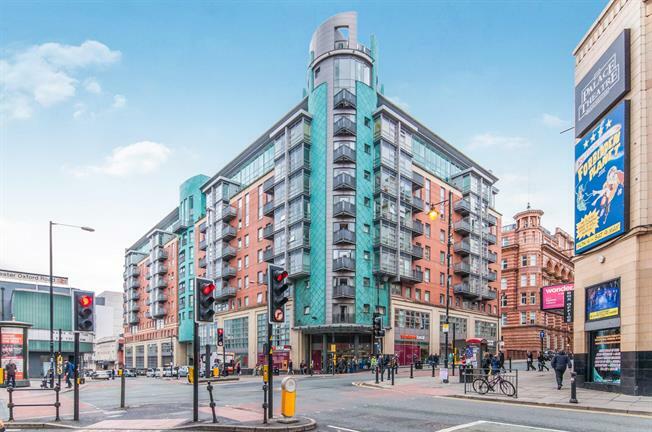 3 Bedroom Flat For Sale in Manchester for Guide Price £425,000. The W3 Building located within the heart of the city centre is serviced by a 24 hour concierge and this noted development is hugely popular. The apartment comprised of a hallway with storage to a superb spacious lounge with a double heighted ceiling. The kitchen is fully fitted and has a balcony off. This floor also occupied a fitted bathroom and bedroom two. To the first floor there are two further bedrooms with the master bedroom benefitting from both an en-suite shower room and en=suite dressing area. The property is completed with a secure car parking space. Laminate flooring, painted plaster ceiling, recessed lighting. Double aspect double glazed steel windows facing the front. Electric heater and storage heater, laminate flooring, beam ceiling, wall lights. Steel sliding double glazed door, opening onto a balcony. Tiled flooring, tiled splashbacks, painted plaster ceiling, recessed lighting. Roll edge work surface, fitted and wall and base units, double sink, circular sink and with mixer tap, integrated, electric oven, integrated, electric hob, stainless steel extractor, integrated dishwasher, space for fridge/freezer. Double bedroom; double glazed steel window facing the rear. Electric heater, laminate flooring, painted plaster ceiling, ceiling light. Double glazed steel window with opaque glass facing the rear. Heated towel rail, tiled flooring, shelving, painted plaster ceiling, recessed lighting. Concealed cistern WC, roll top bath with mixer tap, shower over bath, wall-mounted sink and vanity unit with mixer tap, extractor fan and shaving point. Double glazed steel window. Carpeted flooring, recessed lighting. Double bedroom; double glazed steel window facing the rear. Electric heater, carpeted flooring, a built-in wardrobe, painted plaster ceiling, wall lights. Heated towel rail, tiled flooring, fitted wardrobes, part tiled walls and tiled splashbacks, painted plaster ceiling, recessed lighting. Concealed cistern WC, single enclosure shower, wall-mounted sink and vanity unit, extractor fan. Double bedroom; double glazed steel window facing the rear. Radiator, carpeted flooring, painted plaster ceiling, wall lights. The property has a balcony as well as a secure car parking space.